Ski resorts across the Alps are basking in glory after considerable snowfall has verified a white Christmas will happen. Until last week, many areas lacked snow, with lower mountain regions still looking green. Up to 140 cm has been recorded in some resorts, and the Daily Telegraph reports that only the southern and low altitude resorts are reporting less than average snowfall. With a further 30 cm of snow expected over the weekend, northern Alpine resorts are predicting snow fall will continue, ensuring a perfectly, white December. Upper resorts in France, Austria and Switzerland, are all reporting good snowfall, and while some below mid-level are still relying on man-made snow, everyone is optimistic of a joyful skiing Christmas. Chamonix near the junction joining Italy, Switzerland and France is one of the highest Alp summits, at the foot of Mont Blanc. Renewed for its skiing conditions, and being the most significant and oldest ski resort in France, weather reports predict a range of 30 cm snowfall for the base slopes, 95 for mid and 100 for upper levels. Val D’Isère village at an altitude of 1850 metres also has easy access to many runs sitting at 2,300 to 2,900 metres high. The north-facing slopes should be the best place to ski this winter, with an average of 60 to 85 cm of predicted snowfall between the base to upper levels. Along with neighbouring Tignes, Val D’Isère is part of the Espace Killy ski area giving Christmas holidaymakers plenty of experienced ski routes. 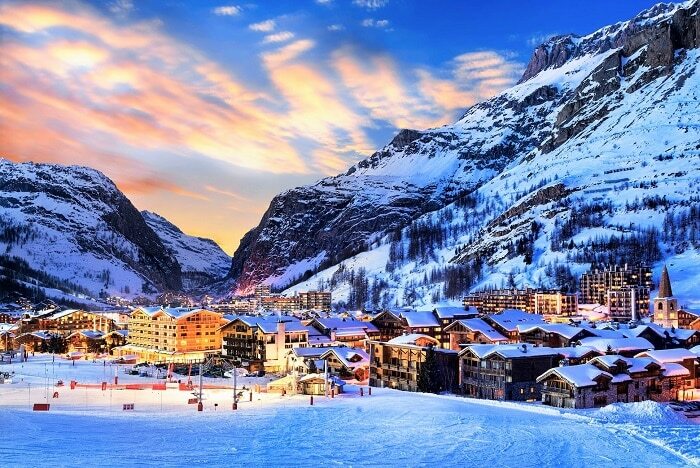 In February 2018, Forbes named Val D’Isère as the world’s best ski resort thanks to its regular snowfall. For up-to-date ski news and articles, follow us on Facebook. Alternatively, our monthly newsletter delivers it all to your desk via email. Sign up for it today or see backdated articles in our ski blog archive.